Despite a longstanding relationship with Peavey that has yielded the highly-regarded JSX signature amp, Joe Satriani appears to have switched to Marshall backline on Chickenfoot's European tour. "Joe used the JVM410 for the show at the Nova Rock festival and will be visiting the Marshall factory this week to have a look around and try out different speaker cabinets. "Chickenfoot recently released their debut album and has taken the states by storm, going in at number 4 on the Billboard Album charts." 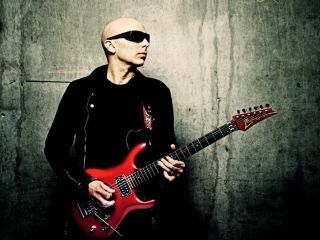 UPDATE: MusicRadar spoke exclusively to Joe Satriani himself this morning. He had this to say: "What can I say? I guess I'm crazy... But, I'm just looking to achieve the best guitar sound every moment I'm plugged in, and that brought me back to Marshall Amps." Where this leaves his relationship with Peavey remains to be seen. If you have tickets to any of the upcoming Chickenfoot shows and you catch a glimpse of Satch's backline, let us know what he's using!